Contentment is a key point for Paul the "love of money....root of evil" discourse in 1 Tim 6:10 (see last post). But if you are 'content', is it wrong to desire to progress? Are Contentment and Progression at odds with each other? A lot of today's youth groups and churches would lead Christians to believe so. But contentment is not an excuse to be lazy. Nor an excuse to be ignorant of money. Being rich is a not sin, but the lust for being rich (greed, coveting, dissatisfaction) is the point at which sin enters in (1 Tim). Contentment is the single most important disposition for the proper use of money. So what then what motivates you to Progress? And should you even strive to excel and progress? Of course! Competition and a pursuit of excellence is an integral part of the Bible. Here's just a few examples. *Jesus says "be perfect." - That will take some striving! These verses are not just talking about some little piece of you that you can label "spiritual," yet forget the rest. They are talking about ALL of you and whatever you do. Try your hardest, not to accumulate things and satisfy your greed, but because it gives God glory. If you are working or making money "in His Name", you better do your best because you are representing Jesus. In many circumstances in America you be rewarded for progressing and the pursuit excellence. If you try your best - at whatever it is - money and blessings often follow. Of course this is not always the case; there are always factors that are out of one's control. But, this is where one's level of contentment is directly tested. Paul was tested repeatedly, and he concluded that he was "content whatever the circumstances" whether in need or in plenty. In the context of wealth, Contentment with Progression leads to the WISE making and spending of money. 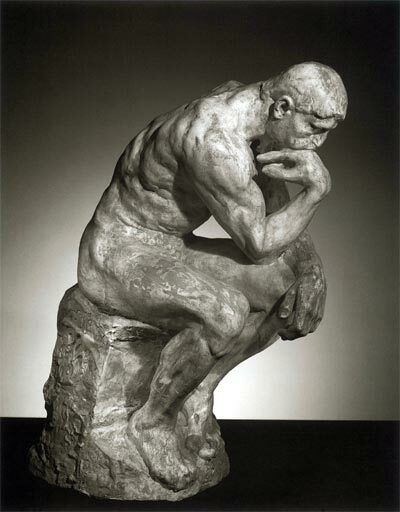 Sculptures: Rodin's Thinking Man is contemplating his level of contentment above. During the Golden Age of Greek art, Discobolus pursues the excellence that led to the Olympics. Does Paul, or Jesus ever describe how contentment can be learned? In my experience, it seems to be that contentment is not a natural human trait.